It’s no secret that baby boomers are completely redefining active aging. This generation’s impact on the industry isn’t going to slow down anytime soon. Last year the population of U.S. residents over the age of 65 reached 50 million for the first time, and is expected to peak over 71 million in 2050. Unfortunately, this growing population does not equal an instant boon for senior living communities. The senior living market is competitive, and many mature adults are electing to stay in their homes as long as possible. For those who are seeking assisted living facilities or senior living communities, they are looking for community, amenities, high-level care and customer service. Savvy communities will find ways to meet today’s senior living design needs while anticipating tomorrow’s trends. Thoughtfully planned multi-purpose spaces offer several ways for facilities to stay competitive in a dynamic and ever-evolving market. Baby boomers will continue to impact the industry; multi-purpose spaces are just one effect of their influence. Multi-use spaces are a good solution for today’s desired coffee bistro while simultaneously meeting the need for fitness classes, meditation sessions and community events. Plus, any space that builds strong community will serve double or even triple duty by appealing to current and potential residents while improving their overall health and increasing the environment’s vibrancy. Multi-purpose spaces also increase senior care facilities’ sustainability by accommodating a variety of perhaps unknown amenities for years to come. Communities that thoughtfully integrate the right multi-use spaces can often save by using less land for new construction or expansion. When reconfiguring existing space or building using new senior living design, consider all the potential uses a space could be. Design tools are available to help a space convert from a classroom to dining area to theater and more. Identifying the potential uses for a space helps Community Living Solutions recommend flooring, lighting and even acoustic options to help a room transition with ease. Focusing on how a room will be used today and might be used in the future is also a great way to ensure maximum versatility. Whether you are looking at multi-purpose spaces or even resident rooms, build with flexibility so that rooms can be converted for higher or lower care options when market demand shifts. Even if your facility is not considering new construction, you can still use multi-purpose space best practices. iAdvance Senior Care suggests reconfiguring residential areas to create neighborhoods within the larger community. To ensure security while also encouraging community, these residential areas can be set up to progress from public to private space. This strategy can be especially helpful for memory care units where both community and security are high priorities. Some facilities are also integrating the community at large into their resident communities, such as offering daycare. Childcare provides intergenerational connectedness that benefits residents and children alike while providing an additional facility income stream. Not all facilities will add a daycare, but multi-use spaces can be used to host other intergenerational activities. Here are just a few forms of events and gatherings that could be hosted in a multi-purpose space. Partner with a local daycare or preschool for a monthly story hour. Invite children’s service organizations (Boy Scouts, Girl Scouts or 4-H) to host a monthly birthday party for residents or to share technology tips. Use the space to host external community meetings each month to help residents stay connected to the civic happenings in your city. The Rotary and Lions or local chapters of the Alzheimer’s Association or AARP are all great examples. No matter what spaces your community converts to serve multiple purposes, design aesthetics should stay timeless. Maintain a neutral color palette with minimal patterns. Natural textures can keep the design interesting without relying on patterns or colors that may become dated. 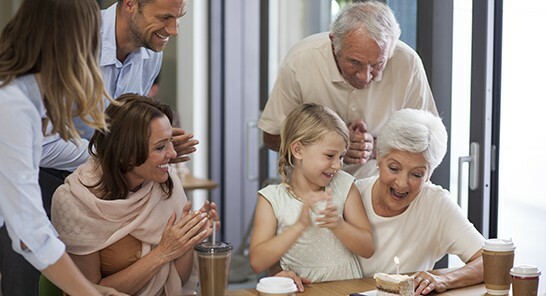 Curious about how your senior care community may benefit from multi-purpose spaces? Connect with our team for a free senior living design consultation. Simply contact us via the website or call Terry McLaughlin at 920-969-9344.